Tennessee’s requirements for overriding a gubernatorial veto are fairly easy on paper. It takes a majority, the same number of votes to override as it does to pass a bill. That works out to 50 of the 99 House members and 17 of the 33 senators. Forty-four other states make it tougher. NASHVILLE — Tennessee Republican Gov. Bill Haslam is sitting in the proverbial catbird's seat when it comes to four potential veto targets of legislation recently passed in the 109th General Assembly. Last week, Haslam became the first governor since 1998 to survive a veto override attempt, this on a controversial bill that sought to make the Holy Bible Tennessee's official book. A group of frustrated House Republicans, fearing more vetoes were forthcoming, did a legislative belly flop as members tried unsuccessfully to persuade colleagues to go along with the first veto override session of a governor since 2002. Now Haslam seemingly has a free hand since lawmakers adjourned Friday and aren't scheduled to come back en masse until January. Under the Tennessee Constitution, a governor has 10 days, excluding Sundays, to decide whether to sign, veto or allow a measure to become law without his signature. * A controversial bill that would allow mental health counselors and therapists to reject LBGT clients based on their "sincerely held beliefs," provided they refer the patients to other professionals. * A bill enshrining the elimination of Tennessee's Hall Income Tax on stock dividends and certain types of interest in 2022. * A bill allowing full-time faculty and staff at public colleges and universities to go armed on campus, provided they have a state-issued handgun carry permit. * A resolution ordering the state to file suit against the Obama administration over the federal government's refugee resettlement program here. If the state attorney general refuses, the resolution directs the lawsuit be handled by a conservative out-of-state group. 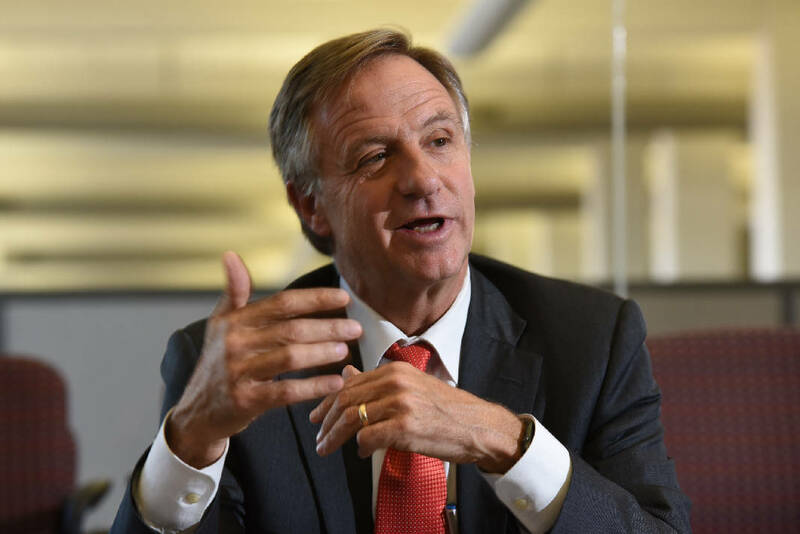 Now in his sixth year as the state's chief executive, Haslam was non-committal last week when asked by reporters whether more vetoes might be forthcoming on last-minute bills passed by fellow Republicans in the GOP-dominated General Assembly. "They have a constitutional responsibility, and we do, too," Haslam told reporters. "And so on some specific bills, we had some conversations, and I just said, 'Here are some things we're thinking.' But I wasn't going to give everybody a blanket assurance that we aren't going to have any vetoes and take that to the bank." Asked about the elimination of the Hall Income Tax, which raises about $300 million annually for state and local governments, Haslam said he "would have been much more comfortable with having something that just did it this year where we know what the state's fiscal situation is every time we make that decision." He noted lawmakers "felt like it was good to put in a point certain by 2022 for it to go away. But as for me, I liked it the way we had it." The governor has resisted eliminating the tax in the past but agreed to go with a one-time cut in 2016 with annual assessments on whether state finances could handle more on an annual basis going forward. So does that mean a Haslam veto? "The answer to that will be like everything else," the governor said. "We will take it and study it and, over the course of time, will come back with a response." Rep. Dan Howell, R-Georgetown, who sponsored the counselors bill, said last week that administration officials have told him the governor "appears to be happy with HB 1840 and he may sign it." Last week, the American Counseling Association and the Tennessee Equality Project issued a joint plea to Haslam to veto the measure. "Tennessee will become the only state in the country to invalidate the American Counseling Association's Code of Ethics, and the vague language will open a Pandora's box of discrimination toward Tennesseans, most blatantly toward the LGBT community," the groups said. The Tennessee Immigrant & Refugee Rights Coalition, meanwhile, is urging the governor to veto a resolution requiring the state sue over the refugee resettlement program. The governor hasn't said what he intends to do. Haslam took one feared veto off the table last week. It changed several state stormwater runoff provisions. In his statement, Haslam said the bill was confusing and had other issues. Nonetheless, the governor said in his official message to Republican Senate Speaker Ron Ramsey that he was allowing it to become law without his signature. Overriding a veto is a relatively simple affair in Tennessee. The state Constitution requires a simple majority of members — 50 in the 99-member House and 17 in the 33-member Senate. That's the same number required to pass a bill to begin with. Tennessee is one of just six states, others include Alabama, with the easy override provision. That forces governors to work hard at blocking legislation they don't like during the legislative process or else be nimble in persuading lawmakers not to override their vetoes. Haslam's veto of the Bible bill is his fourth since becoming governor in early 2011. The attempted override got 43 "yes" votes and 50 "no" votes, while four representatives simply voted "present." The last time lawmakers failed in a veto override vote was back in 1998 when senators' attempts to repass a bill vetoed by Republican Gov. Don Sundquist failed on a 13-19 vote, according to information compiled by the General Assembly's librarian, Eddie Weeks. The bill sought to authorize judges to require first-time DUI offenders to pick up litter from highways instead of serving 48 hours in jail. With the exception of the legendary Democratic Gov. Ned McWherter (1987-1995), a House speaker prior to becoming governor, every Tennessee governor from 1979 on has seen some of his vetoes overridden by lawmakers. McWherter was able to head most issues off before passage. He issued just one veto in eight years of office. It was over a bill hiking cash awards in charitable bingo games that a federal probe found to be riddled with fraud. Republican Gov. Lamar Alexander (1979-1987) suffered the most veto overrides in his dealings with a Democratic-dominated General Assembly. Of the 30 measures Alexander vetoed, 14 were overridden. Contact Andy Sher at asher@timesfreepress.com, 615-255-0550 or follow via Twitter @AndySher1.